The Canadian Pacific Railway (CPR), also known as CP Rail (CP) is a railway in North America with track in both Canada and the United States. It was built between Eastern Canada and British Columbia between 1881 and 1885. Although it used to go all the way to Atlantic Canada, it does not do so anymore. 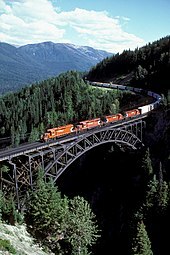 When British Columbia became part of Canada in 1871, one of the promises the federal government made was to link it to the rest of Canada by rail. Most of the trains that use the CPR carry freight, and the CPR used to run passenger train services until they were taken over by Via Rail in 1978. For many years, until the airplane was invented, the railway was the only way to move people across the country. Because of this, it had a big role in the settlement and development of Western Canada. The company that owns the CPR, Canadian Pacific Railway Limited, was once one of the largest and most powerful companies in Canada. It owns about 20,000 kilometres (12,500 mi) of track from Montreal in the east to Vancouver in the west and Edmonton to the north. CP also has track in Minneapolis-Saint Paul, Milwaukee, Detroit, Chicago, and New York City in the United States. The logo of the CPR company is a beaver, the national symbol of Canada, and it has its headquarters in Calgary, Alberta and its U.S. operations are in Minneapolis. It trades on both the Toronto Stock Exchange and the New York Stock Exchange under the ticker CP. ↑ 1.0 1.1 Canadian Pacific Railway (28 January 2011). "Canadian Pacific trains across North America pause for day of mourning". webcache.googleusercontent.com. Archived from the original on 30 April 2009. Retrieved 4 February 2011. ↑ "The Top 200: Canada's Largest Companies (c1973-74)". Western Libraries, University of Western Ontario (6 Side). 2008. Archived from the original on 23 February 2008. Retrieved 8 April 2008. ↑ "Canadian Pacific's U.S. HQ moves to new digs". Star Tribune. Retrieved 9 May 2016. Berton, Pierre (1970). The National Dream: The Great Railway, 1871–1881. McClelland and Stewart, Toronto. ISBN 0-7710-1326-4. Berton, Pierre (1971). The Last Spike. McClelland and Stewart, Toronto. ISBN 0-7710-1327-2. Cruise, David and Alison Griffiths (1988). Lords of the Line. Viking, Markham, Ontario. ISBN 0-670-81437-7. Innis, Harold A. (1971) . A History of the Canadian Pacific Railway. University of Toronto Press, Toronto. ISBN 0-8020-1704-5. Leggett, Robert F. (1987). Railways of Canada. Douglas & McIntyre, Vancouver, British Columbia. ISBN 0-88894-581-7. Sandford, Barrie (1981). The Pictorial History of Railroading in British Columbia. Whitecap Books, Vancouver, British Columbia. ISBN 0-920620-27-2. The Premier's Funeral (11 June 1891). The Woodstock Evening Sentinel Review, p. 1. Lavalle, Omer; Marshall, Tabitha (4 March 2015). "Canadian Pacific Railway". The Canadian Encyclopedia (online ed.). Historica Canada. This page was last changed on 13 July 2017, at 18:45.